Stand-Up Comedian Helps People Stand Up To Debt! Everyday we spend money and get back change. Sometimes it might be a few pennies, other times it may be almost a dollar. But where does it go? You may not really care but you should. The coins you toss around everyday may not seem like a lot. But over time they can accumulate into quite a bit. Invested well, they can literally turn into tens or even hundreds of thousands. 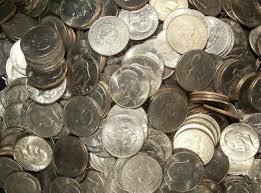 Many times if you buy something that cost $3.05 you may pull out a nickel to avoid getting back 95 cents in coins. Well, stop doing that. Instead pay with paper bills and get back the coins. Once or twice may not seem like much, but if you do this every single time you make a purchase it can really add up. Try it for a few days, then at the end of each day put your coins in a jar or another container. In less than a week you’ll see how they are piling up. At the end of the month you may have close to fifty bucks or even more just in change. That may not seem like much, but after a year that could be $600. If you invest that $600 a year in a decent mutual fund that averages 11% interest (the average for over 80 years) you will have a little more than $11,100. Continue to do it for another ten years and you’ll have over $42,750. Continue to do it for another twenty years after that (a total of forty years) and you’ll have over $387,000! Not bad for just some coins that you thought were worthless. Or even if you don’t invest every penny you can still let them accumulate and buy something with cash that you might have otherwise financed. I know people who have bought new TVs and refrigerators with the change they saved over several months. It may sound crazy, but having a pocket full of change is much better than having a mailbox full of bills.